I’ve enjoyed model railroads since I was in my early teens. Good quality commercial model kits can be quite expensive. After seeing some fine models made from cardstock, I decided to design and build my own cardstock kits. This page showcases some free examples. My friend, Jim Kellow suggested I add some more advertising to some models. I’ve just added a New Tracks logo to the cabin and container models. Stop by S Scale Resource and O Scale Resource magazines for articles, photos, and profiles from master modelers. If you decide to try your hand at any of these, I’d love to see a photo or two of your creation. Here is a page of basic construction techniques for all cardstock models. Most of these are in “O” scale which is 1/4″ to the foot. 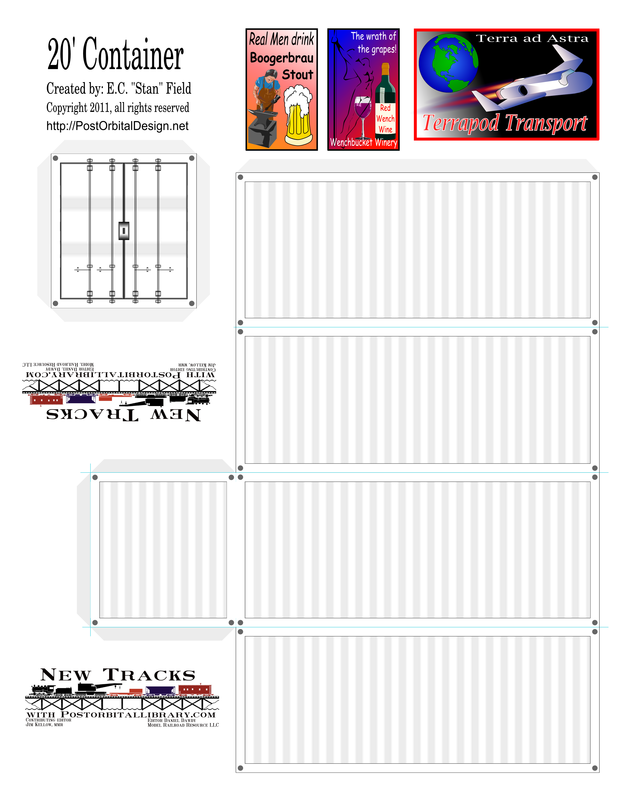 If you wish to use them in HO scale, then print the sheets at one-half size. The items on this page are free for the downloading. Please keep in mind that I retain copyrights to each one and do not allow reproduction for commercial purposes. These files are provided only for your own modelling pleasure. I’ve even included a page on Recommended Tools. All these images and downloads are copyright 2018 by E.C. Field. In order to download, click each item to view the largest size, then Right-Click and Save-As to download. 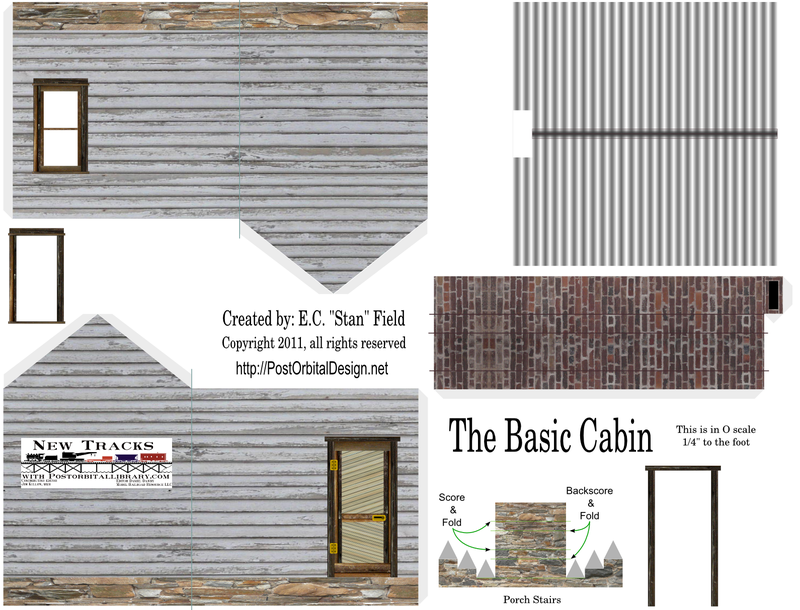 The first item is a very simple mountain cabin in “O” (1:48) scale. Awhile back, I accidentally found this ancient iron furnace. I did some research and found a bit about the history of the site and decide it would make a great educational project. This ended up being a bit of an adventure, so I’ll give it a page of its own. Click here for the model, build history, photos, and instructions. Terry’s Tavern will be available shortly. This image will produce four postcards on a single 8.5″x11″ sheet of cardstock. 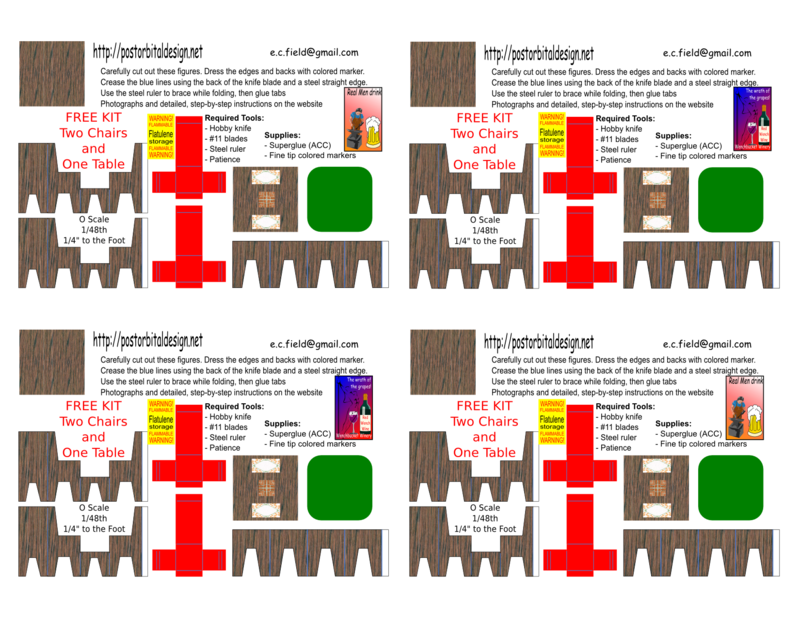 Each postcard contains a kit for one table and two chairs in “O” (1:48) scale. This is the latest edition to my free cardstock collection. Click the photo for the kit and information. Here’s an O scale twenty-foot container. It has no printing on the sides so that you can print your own advertising markings to make it any real or fictitious brand you wish.